Well the Mavic Pro 2 has finally arrived. I already own it and I found the closest and best drone to compare it to would be the Autel Evo. I’d like to note real quick that I did a comparison between the original Mavic Pro and the Autel Evo here in which my opinion was that the original MP was still better only because when released, the Autel Evo proved to be much more underwhelming than it claimed to be. Had it been released with the specs and potential it was marketed on, it would have won for sure. But that is thus far not happening. Update: That has changed! The Autel Evo is now better than the original MP because it fixed most of it’s bugs. MP 2: 20 megapixel camera, 1 inch sensor, 4K at 30 FPS shooting capability and at 100 mpbs. Evo: 12 megapixel camera, 1.23 inch sensor, 4K at 60 FPS and the shooting capability is at 100 mpbs. 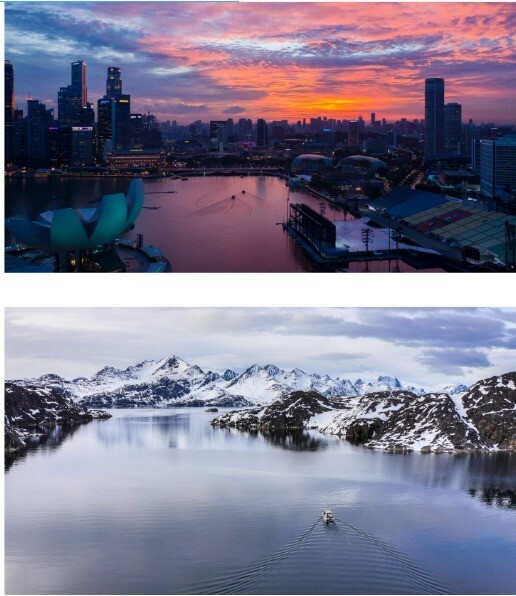 Now these comparisons are on auto and manual, but expert camera people do say that in post, the Mavic Pro 2 is a FAR superior drone when you really work on the image. Personally, I don’t use any post processing programs and prefer the out of camera footage. Now as for still images, the MP is from what I have seen as good and even better than the Evo. On paper, the MP 2 wins and in reality, it wins even more and that’s because the Evo uses enhanced WiFi for its connection which can really be unreliable (you will likely not reach 7 KM unless you’re in good, open conditions). The MP 2 however uses ocusync 2.0 which is absolutely incredible. I’d been more than pleased with the MP 1’s ocusync connection as it’s been quite literally miles better and more reliable and MP 2’s 2.0 connection is taking that even further. While I doubt most people will reach 8 KM unless the right conditions are present, the fact is, you’ll likely (and this is my prediction) get 2-3x better/longer range on this model than on the Evo. Being that I’ve had and used enough drones with WiFi, lightbridge and ocusync, (differences explained) I know that the latter is the most reliable. Again, on paper, the MP 2 wins, but in reality, the Evo’s flight time is from what I have seen through multiple sources, greatly exaggerated. The flight time is closer to 20-25 minutes and even in that regard, the original MP wins in flight length. Truth be told, the MP 2 probably won’t hit the 31 minute mark, but my experiences show it to be close to 30 minutes and it handles VERY well in most weather circumstances. Evo: 2 sensors (there’s a third, on the back, but it doesn’t actually work, it’s more of an infrared sensor). MP 2: 4 constantly working sensors and 6 if you activate intelligent flight modes, literally an all around protection. One more, MP 2 wins. Even despite the fact that the 6 sensors only work when there’s an intelligent flight mode enabled, there’s still 4 very reliable sensors to work with. The Evo does have it’s own list of intelligent flight modes and it’s capabilities are very close to if not even with the MP 1, but the MP 2 blows it out of the water, sorry Autel folks. It’s intelligent flight modes aren’t only in larger amounts, but they are smarter. The active track is better, the flight modes are better, and because of the ocusync connection, all of that is even more reliable. Additionally, the MP 2 is better in low light conditions, being that it now has an LED light on it’s belly for helping it land better and it spots water better keeping it safer. Conclusion: Mavic Pro 2 is slightly better. Overall specs, safety features, control, flight time, range ect… all favor the MP2 and when the camera is compared, it’s really a toss up and again, this is both because the Evo in my opinion OUTDID itself in the camera field, and also because the MP 2 unfortunately didn’t give the consumers the full potential of that 1 inch sensor. I am VERY much hoping for the camera to go through upgrades to fix this, in which case it would beat the Evo, but should that even happen, it would still not take away from the Autel being an awesome drone on it’s own with a FANTASTIC camera. Certainly the $500+ LESS you’d pay for it too is a HUGE bonus as well. Personally, while I am a bit underwhelmed with the MP 2 given all that went down, HAD I known about these issues before the purchase, I would have bought an Autel Evo. But I still think the MP 2 is better after my experiences, I just don’t see any reason for me to buy the Autel now as I feel I wouldn’t get any kind of new drone. See how it would perform in sales. Analyze the data on how the sales went and see where people most complained about it. And with the first one’s release, there’s plenty to fix! 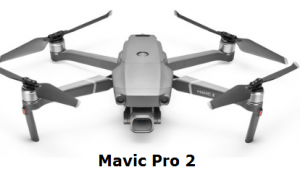 They knew the Mavic Pro 2 (full review) would surely follow the release of their Evo, and they also knew it wouldn’t beat the Mavic Pro 2, but perhaps seeing the specs on the new Mavic would let them mimic that on their later models. This is a smart move on Autel’s part, because now they have a much more specific blueprint to follow as to what their next tier drone should look like. Their first generation model mimicked the Mavic Pro and attempted to be better (it didn’t do that very well), but perhaps their next generation model will mimic the Mavic Pro 2 and possibly surpass it. When it comes to filming, I have to be honest and say that I am very pleased with every single model’s potential, even the MP 1, which I still think is phenomenal. But after I see that all 3 cameras on the 3 drones make me happy, I have to look at the quality of the drones and see which ones I can rely on to keep the flight safer, give me a better, longer connection and just basically give me less of a headache and without a doubt the Mavic Pro 2 does that. Even the Mavic Pro 1 is better in that regard. What about the Mavic Zoom Vitaliy? The Mavic Zoom is basically the Mavic Pro 1 drone with better flight capabilities and a similar camera, except it has more filming features. So in that regard, the Evo still beats those 2 drones. It’s truly a competitor and at the top of the lineup of portable, high quality filming drones, despite the MP 2 being on the market too. Folks, it’s finally here. 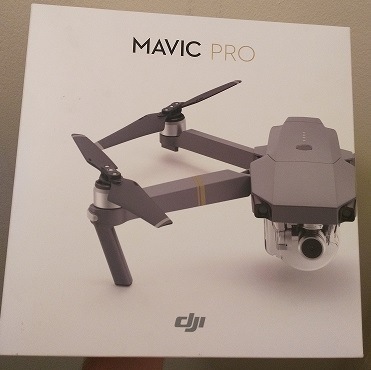 I am a HUGE drone fan, own 4 DJI models and have digested many hours of research through video reviews, blogs, the DJI site, you name it in trying to decide on whether or not I should get the new Mavic Pro 2 and in the end, I took the plunge and ordered it (I decided not to get the Zoom version though and I’ll explain why later). 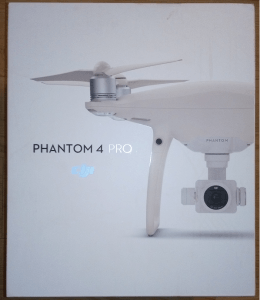 Having gathered a ton of information on this new model which ultimately led me to buying it, I’d like to, in this review, help you decide if this drone is the right choice for you (there’s a 99% chance it is), or if you should go with the Zoom. Note: First I will take a look at the Mavic Pro 2 (the one I got). Underneath that will be the official review of the Mavic Zoom. So if you’re stuck on which one to buy, I recommend reading this from the top down. If you want the Zoom more than the MP 2, just skip the initial review and head to the next one. Name: Mavic Pro 2 & Mavic Zoom. Flight time: 31 minutes for both models. Range potential: 8 kilometers tops. Size: It is SLIGHTLY larger than the Mavic Pro (still very portable though). Here is the direct DJI link to both models. Sensors? Yes both models have 6 (360 degree) sensors, BUT they are not always active (I’ll explain). For the Mavic Pro 2: 1 inch sensor, 20 MP, 4K @ 30 FPS with 100 mpbs, also 1080 video transmission. 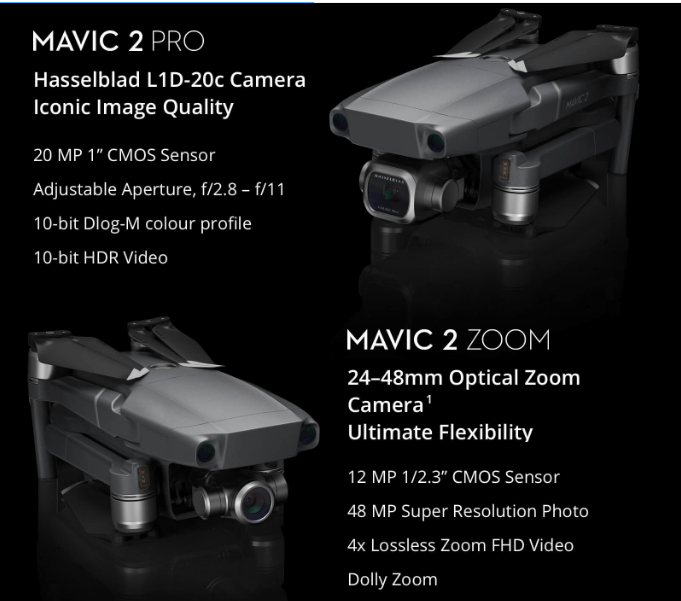 For the Mavic zoom: 1.23 inch sensor, 12 MP camera, also 4K @ 30 FPS with 100 mpbs and a 1080 transmission on remote. Basically the MP 2 has a better camera and the Zoom’s camera is almost identical to the first MP camera, but has more picture taking features (including an actual Zoom). Mavic Pro 2: 95 out of 100 points. Mavic Zoom: 92 out of 100 points. First, let’s review the Mavic Pro 2: Has a new king of portable drones arisen? As of right now and probably until the beginning of 2019, it appears to be so. There was speculation that the Autel Evo or the Mavic Air could have claimed that title (at least my titles ;)), but with all the sensors, all the flight features, the flight time, the range, the actual 1 inch sensor camera with 20 megapixels by the way, I think it’s safe to say the MP 2 is the new king. 1) Let’s take a look at the camera. The best in the market? Yep. A 1 inch sensor on a portable drone is a first in the industry and it means it’s the best in the market so far. Add to it the 20 megapixel camera, and you basically have the equivalent of a Phantom 4 Advanced (or Pro) filming machine in a smaller size. This is something I also said regarding the Autel Evo, until I saw the comparison footage and felt the P4P was still better. Also the new camera is of the Hassleblad camera, which to be honest, I know very little about (it’s considered top tier in camera companies). While I am a bit disappointed the camera can’t shoot 4K in 60 FPS like the Autel Evo or Phantom 4 Pro could, the fact of the matter is that it’s not really a big deal as the footage you take on video will still be crispy as it is (also there’s a 100 mpbs so that basically makes up for the lack of the 60 FPS in my opinion). Now an additional thing on this model is that the camera can actually point up. I will admit that I didn’t know but the original MP actually had this option too, which could be enabled, the MP 2 however has it set up so you don’t need to turn it on. But in any case, this upward filming feature basically makes the filming potential almost as good as the Parrot ANAFI (another comparison I will do at a later time). The only difference is, the ANAFI camera can point up more and the MP 2 shoots and films better. See more footage from both this drone and the Zoom here. 2) LED lights installed on the drone. The front (red) lights are now in LED and there is also an additional LED light you can turn on, on the belly of the drone to help it land in areas where there’s little light. This can be activated manually or automatically depending on the light situation around the drone and ensuring it lands safely. 3) More safety features, the best so far. No portable or consumer drone today (well not until this one came out) has 6 sensors and infrared sensors on it. The ONLY one is the Inspire 2 and that’s considered to be a professional level model. But now there’s we can this to the list too. Basically in normal flight mode, the SIDE sensors aren’t active (infrared sensors are) meaning, the drone will give you beeps but not stop if it’s moving on one side against an obstacle. BUT it does have 4 safety, collision “proof” sensors (front, back, bottom and TOP). However, once you activate one of the many intelligent flight modes this model has, THEN you will have all 6 areas act as safety sensors. To be honest, I don’t know why they did this, but having a drone have sensors at the top of it and on the side, even while in my opinion it’s not ideal, is still better than any other model I’ve had so far (Well actually my Phantom 4 Pro also has sensors at it’s side). But yeah, keep this in sensor thing in mind guys, it’s important. Also: This new model is apparently even better as sensing water and avoiding it, something which previous models did not have to the same level. In fact, one of the reasons people dislike flying their drone over water was due to this problem. I’ve personally never had a problem with that, but I still keep it on the safe side and never get too close to it when I fly. From the initial reviews I’ve seen, the advertised 30 minutes plus is more like 25 minutes and up, but either way, it’s plenty (for me at least). Basically the thing flies longer than any other portable drone on the market today. 5) More range, ocusync 2.0 (yes!). I have talked extensively about my experiences with the original MP and how it’s ocusync technology is hands down the most reliable connection on a drone I’ve ever flown with. Even in the worst, most transmission interfering areas, I’ve gotten at least 1-2 kilometers out of it and in open areas, well you already know how much better it is there. But to have that awesome technology upgrade to the next stage and be on the Mavic Pro 2 and to extend the MAX range from 7 to 8 kilometers (5 miles) makes the MP 2, despite my disbelief even better. 6) Updates to the remote. The remote is basically the same exact frame as the one on the original MP, in that it’s the same size, has the same type of screen which shows you flight info, but the difference is that it has removable joysticks like on the Mavic Air and there is also a button to the side of the drone which has the regular, sport AND tripod mode buttons on it. 7) 1080 image transmission to your phone. While 720 on earlier models was good, a 1080, high definition transmission will make flying it in greater distances and seeing what the drone sees even better. 8) It’s even more stable. Out of my 4 drones, the Mavic Pro is without a doubt the most stable of the bunch and this new MP 2 is even better in that regard. This will allow pilots to have better, safer control over it. 9) New ESC and quiet propellers. This new drone has been noted to be 5-10 DB quieter than the original MP, but about 1-2 DB louder than the MP Platinum. Either way, it’s still a generally quiet drone model and the ESC as well as battery life allow for the almost 30 minutes of flight time (in ideal conditions). 10) More intelligence all around. 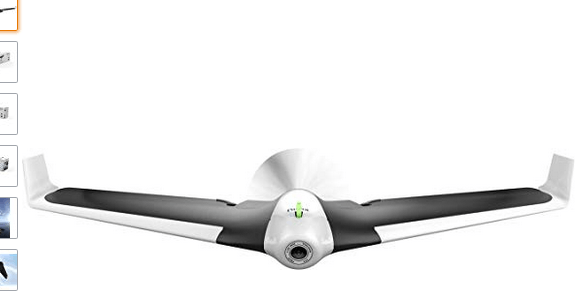 It has an upgrades APAS system which helps it avoid obstacles while still flying, it’s follow functions have improved and overall, the intelligent flight features are crispier. Pretty much, this drone is far more reliable in helping you get that best shot than ever before. My overall Mavic Pro rating: 98 out of 100 points. I don’t know about you, but personally, this new model makes all my previous ones obsolete. Though I’m not going to sell them, when I go traveling, I won’t need to have multiple ones with me anymore. From now, this is the only one coming with me. 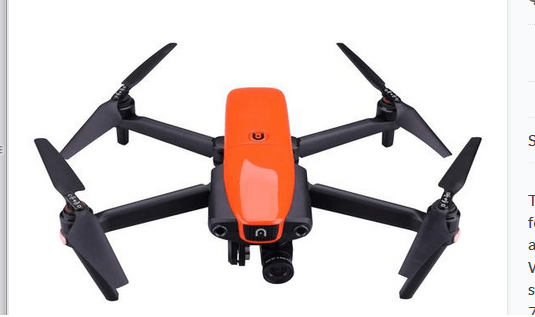 Click here to get your hands on this drone. Note: DJI has made buying this drone a lot easier with their Affirm payment option. That is actually what I used to buy this drone. I simply pay in installments. Learn more about Affirm here. 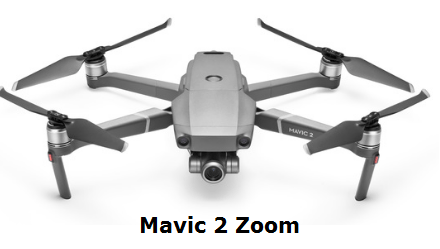 Mavic Pro 2 vs Mavic 2 Zoom. What’s the difference? Everything in both models is exactly the same except the camera, that is literally the only difference. They both have the SAME exact drone body. Same exact ESC and quiet propellers. Same intelligent flight modes (and reliability). This is not the same quality camera as you’d get on the MP 2. Instead of a 1 inch sensor, it is a 1/2.3 inch sensor which does unfortunately man it shoots a little bit less well. Firstly, the actual zoom ability (obviously). Next is the 48 megapixel “super resolution” photo. My initial opinion of the Zoom is that it’s camera is very similar to the MP 1 camera, but with more features. Plus with the actual drone being superior in just about every way, that’s one way to look at the Zoom. My rating for the Mavic 2 Zoom: 92 out of 100 points. Click here to get this drone. Note: As I said above, you can also buy this drone using the “Affirm” feature DJI has had. 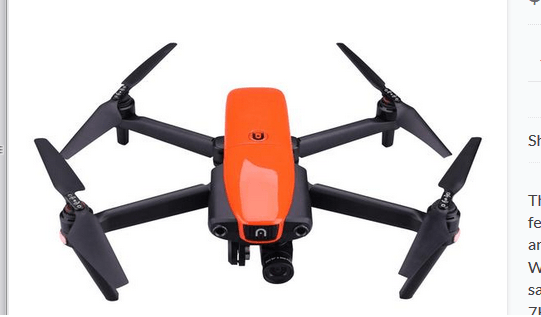 Check it out here, you can own this drone by simply paying in monthly installments instead of the full price. Which drone should I get? If you have never owned the original Mavic Pro, I’d get either the Zoom or MP 2 depending on your budget. If you have owned a MP before, get the MP 2 as the Zoom is basically the same in camera functions and with an overall better drone. My personal choice is the Mavic Pro 2. And I cannot wait to get it! Prior to the release of these 2 models, one of the biggest speculations and ideas going around was that this new drone would have interchangeable lenses and frankly, I would have loved to see that. Let’s say you purchased a Zoom and wanted to upgrade the camera OR perhaps you purchased the Mavic Pro 2 and wanted the benefits of the Zoom’s camera. Should you just buy another model or can you change the cameras on the drone? Well as of right now, the answer to that is that you can send the drone to DJI, request it and they’ll make the change for you (it’ll cost something). Whether or not it’ll be possible for the consumer to manually do this themselves in the future is up in the air, but I hope that it will be possible. So just know that there is assurance in whichever drone you buy, that changing cameras is possible. The Parrot Disco is honestly a good drone but it just doesn’t work the same way as the models we are used to today and I think this is the reason why it gets mixed reviews from people. In this particular one, I want to examine this model and give you the good and bad sides of it. Flight Time: Up to 45 minutes. Range potential: Under the NORMAL set up, you’re looking at about 1-1.5 miles, BUT I have personally seen (and I will provide the YouTube video in this review) of a man who modded this drone and it managed to fly over 25 miles. Size: A very large, yet light drone (made of foam mainly). It’s about 2-3 feet in length. Camera Quality: 14 megapixels, 1080p footage. Rating of product: 55 out of 100 points. This is a good drone, but is more for experienced pilots. It just operates differently than most people who have seen other popular drone models are used to and I think this is lack of understanding is why people give this model mixed reviews. One thing you cannot take away from the Disco is that it has the longest flight time of any known hobby drone today. 30 minutes is considered extremely high and it’s tough to find drone models which reach that (Mavic Pro Platinum has it, Phantom 4 Pro has it, Yuneec Mantis Q does as well and so do the Inspire 1 and 2 models), but those are just a select few out of the many which don’t even come close and even then, it pales in comparison to the Disco’s flight time of 45 minutes, wow. Now of course, anyone who flies drones knows that conditions reflect the flight time but still, this is at the top when it comes to hobby drones. Camera’s not bad at all. Yes 4k drones are the rage today, but 1080p is still awesome footage. Considering how much time you have to film with this drone, it’s not bad at all. Considering most of it is made of literal foam, this thing can crash just about anywhere and against anything and still be fine. I’ve seen videos of this thing crash into trees and land and be completely fine. The foam is what makes it so durable. Don’t let the short range trick you. I though it sucked when I saw that the Disco could get a little over a mile in range, until I saw a YouTube video of a popular drone flier by the name of Dustin Dunhill, who modified the connection inside the drone and basically installed some sort of sim card to basically make this drone have as much range as a cell phone. I’ve often had to carry heavy and light drones on my trips and believe me, I elect to use the lighter ones anytime I can. Considering how light this model is, it’s not a big deal to carry it around, if nothing else, the carrying case that goes with it is more annoying to carry than the drone itself. Only 1 kind of flight mode: Fixed wing mode. There’s a few very important things you need to understand about this drone and one of them is that it simply CANNOT hover in 1 spot like other models do. It only operates in what’s known as “fixed wing mode” which basically requires that it always needs to be in motion in order to actually keep flying. This isn’t really a bad thing, but unless you’re a beginner and expecting a regular hover over ground, the Disco is not for you. Fixed wing mode is fun to use, but it makes it tough to get good shots (which is another con coming up). It’s tough to capture good footage. 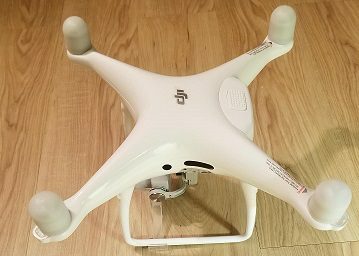 Because this drone can’t really hover in one spot, it makes it tougher for those seeking to capture good footage to actually do it. This model is made more for the flying experience rather than shooting good shots. The foam material can be an issue. I mean unless you can mod it like Dustin did in the video above, you’re really looking at short range drone model that can’t really shoot well. And even though it can survive crashes, the actual foam material may be more breakable than other models on the market. So be careful when flying this thing. There’s none on this drone, and even if it were possible to install it, there’s no way you can really use it because this model relies on constant motion to fly. It does have an auto landing feature, but that requires a flat surface. Taking off can be a mixed feeling. Like I said, you need a flat surface, particularly flat grass fields. This thing can land on it’s own, but it’s literally like an airplane without wheels when it does it so it can get scratched up (it’s foam, but it’s expensive stuff still! ), so if you do it on grass, you can avoid having issues. As far as I know, there is no return to home option (as well as sensors like I mentioned). It does have a GPS, but there’s no real auto pilot to guide it back in case you lose connection. Is the Parrot Disco the drone for you? 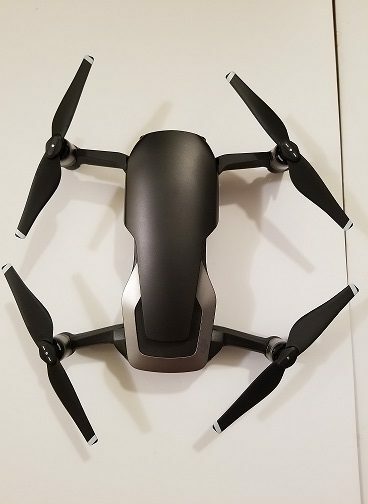 Although I listed more cons than pros in this review, I wanted to point out every single good and bad thing I could find regarding this drone to help you decide if it’s for you. My personal opinions on it are that it’s not really a good drone for beginners and if you seek a model with fixed wing mode, get yourself a Mavic Pro since it can always turn back into a normal drone that hovers around and takes awesome footage (it has intelligent flight modes you can switch to for this). I just can’t think of why it would be good to pay $500-$600+ for a drone that is made mainly of foam all the while you have other, better shooting models that can do more. Yes the Parrot Disco can fly longer and if modded enough can fly further, but what is the point of that if you can’t get great shots of stop in the mid air, hover and take your time. Believe me, flying a drone for even 20 minutes can get boring, let alone 45 minutes. Great camera, actual portability, ease of us, reliability and more. Now I do believe that once the MP 2 comes out, it’ll probably (ok, let’s be honest, it’s 100% certain) be better than any of these I am about to list, but if you’re tighter on money or perhaps just want a GREAT drone to fly around with, I assure you, these 5 models are absolutely incredible and I would even bet you’d have a hard time seeing the difference between the awesome footage they shoot vs the MP2 and when it comes out. 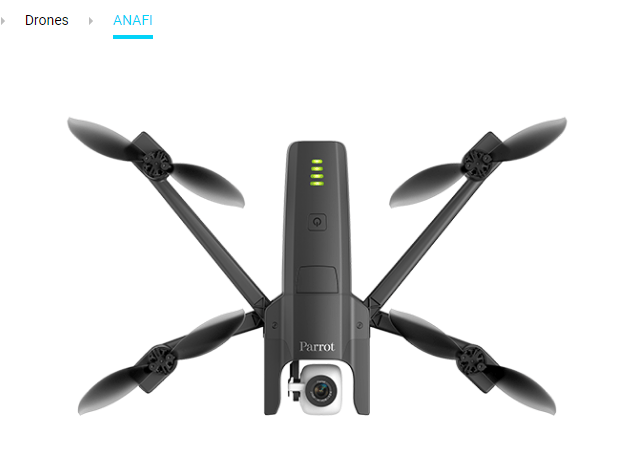 Parrot released a new model in 2018 to compete with the top tier ones in their market and it comes in the form of the ANAFI, a 20 megapixel, 4K @ 30 FPS model that is honestly remarkable in a few ways (and lacking in some). The first AWESOME distinguishing feature is it’s 180 degree camera which NO portable model on the market today has and it’s a brilliant idea I hope is mimicked by other models. This allows people to film whatever they want from a bottom up view and it offers an entirely new world of filming opportunity. Added to this is the awesome zoom capabilities the camera has as well as the fact that the camera is awesome. The model itself is very quiet and can fly around for a good 20 minutes. Although one of the biggest issues is the fact that it has no sensors and requires some advanced flying skills to use properly, it’s still a very good model to consider. I rated the ANAFI at 70 out of 100 points. You can read a full review of it here. There was a brief moment in time when I got the Mavic Air where I rated it 95 out of 100 points and that was because I was REALLY impressed by how well it flew and even more so how well it shot footage, but as time went on, and I started seeing some of it’s flaws, I reduced the rating, but never the less, this new and updated rating is still quite high. The Mavic Air in general is one of the smallest and convenient portable drones on the market today. It’s camera shooting capabilities are remarkable and it’s flight capabilities are no joke either. Coming in with 3 safety sensors and a decent 1-2 mile range (it depends on certain things), this model is one of the best ones out there for shooting footage especially if it’s within your line of sight. In that regard, I consider it to be one of the most reliable for taking pictures and videos. It has a 12 megapixel, 4K @ 30 FPS shooting capability and also includes an internal filming/picture storage of 8 GB. The only downside I’ve found is that there’s a pretty short battery life and that it can’t really fly too far when there’s too much range interference, otherwise, it’s awesome. Here’s a full review of the Mavic Air. It’s current rating is 80 out of 100 points. This model marks Yuneecs first drone in the portable field and it’s awesome. It takes ideas from many of the greats in the existing portable models today and utilizes it VERY well in itself. It has a 4K, 30 FPS camera and suposedly gets close to 30 or more minutes in flight time. Although one issue is that there’s no obstacle avoidance, it still flies very well and I would put in line with the ANAFI but more reliable in my opinion. I’ll be doing a more thorough review of the Yuneec Mantis Q very soon but as of now, I’d rate it at 83 out of 100 points due to it’s GREAT camera and AWESOME flight time. Anyone who is familiar with the Autel Evo may wonder just why I would rate this as number 2 and not 1 on this list. After all it does have the best camera in ANY portable drone model on the market as of TODAY (wait until the Mavic 2 comes out), and I even admitted it, but then why does it rate as #2? Well because I have said that many of the promises this model was set to show us prior to it’s release did not meet expectations once it actually was released. Yes it does have an awesome camera, but in many of the other promised areas, it seriously lacked backing up those promises and I know the people of Autel are working to improve it, but it still needs a long way to go to reach what it was said to be capable off. Now despite those set backs, the Autel Evo is still a GREAT model and gets an 85 out of 100 points. In fact, if it met the promises it had on paper, I’d probably make it a 95 out of 100, but that lack of meeting expectations really set it back. Can you get great footage with it? YES! Can it fly well and is it reliable? YES! So in that regard, this is #2. Here’s a full review of the Autel Evo. #1: The original Mavic Pro. Despite being 2 or so years old at this time, I still believe the Mavic Pro is the best portable models on the market. Once again, when the Mavic Pro 2 gets released, it’ll be a different story, but if you’re still on the fence about buying this original model, and you’re tight on money to spend $1,000+ which is what the MP 2 will most definitely be, don’t wait, get it the original because it’s still the best one. I rate the Mavic Pro at 90 out of 10 points because in many ways, not only does it film incredibly well, but it really EXCEEDS expectations in just about every regard you can imagine: Filming capability, flight time, RANGE potential (it’s still the best), and overall the reliability of it as a whole is at the top. In my opinion, anyone who has flown this drone for an extended period of time AND has tried the others on this list would either agree with me placing it at #1 or at the very least agree, it’s in the top 3 and there’s a good reason for it. The Mavic Pro can and WILL be a classic in how well it films. To this day, my jaw still drops when I look at what it’s able to capture and how well it flies (full review and footage). I also make the argument that it’s so good, that the other models, actually model themselves from it. After all, the Mavic Pro WAS the first original PORTABLE drone to be released in the drone market and it’s solidified it’s status as being one of if not the best portable drone today. New #1: Mavic Pro 2. If you’re seeking a portable drone that will be sturdy, reliable, safe and will shoot better than any other drone on this list, then the Mavic Pro 2 is the one to go with. While the others are good and even great, this is the greatest one as of right now. Learn more details about this drone here. Which drone would you rate at the top on this list? The Mavic Pro. In this comparison (here), I basically concluded that the Evo was better in terms of camera quality, but otherwise, the Mavic Pro was still the better rated drone, so I rated it a little bit higher in points. The Mavic Air. In this comparison (here), I believed the Autel drone was better in various functions: Camera quality, overall flight time, overall reliability and so on and did rate it higher than the Air. But the air did have a few advantages such as smaller size and the fact that it’s backwards sensor actually worked as opposed to the Evo. So if you’re wondering how Autel’s new model takes on it’s DJI competition, you are welcome to check out those articles above. 20 MP camera, 4K @ 60 FPS and 100 mbps filming quality. To date this is the single best drone I’ve ever shot videos and photos with. See footage here. It has a 30 minute flight time (closer to 27 minutes in most circumstances where I’ve flown). The range is around 7 KM, but I usually get about 4-6 in open areas and 1-2 in areas with a lot of obstacles. 5 sensors (everywhere but at the top). Over 10 intelligent flight modes. My rating for it is 95 out of 100 points. 12 MP camera, also 4K @ 60 FPS and 100 mbps video capabilities. As of now, this model has the best camera on any PORTABLE drone models on the market. Also has a 30 minute flight time, although as I’ve said before, the tests I’ve seen shown it to be 20-25 minutes. Also there is a 7 KM range like the P4P, but this usually only happens in completely open areas with no signal interference. The usual range tests are between 1-4 km. This has 3 sensors, although upon release, it was noted the back sensor wasn’t really working, it just beeps to warn you, but it doesn’t stop the drone if you get too close to an obstacle (this may have been updated since). Several intelligent flight modes too including a very smart return to home. My rating for it: 85 out of 100 points. Now if you just compare the specs based on the above things I listed, it’s pretty clear that the P4P holds more value and benefits, but this is where you have to look at both models more closely. So this is where I want to note what happens if we compare specific things between both models such as the camera. In which case will it really be better? In terms of video filming capabilities, both models, on paper have the same specs. However, when it comes to actual filming and picture taking, you’re looking at a 20 MP camera vs a 12 MP one, and I have to say, this isn’t a big deal because if you examine the footage, you may have mixed views. By the way, this man has an awesome YouTube channel on this hobby so be sure to subscribe to him if you enjoy his content. Reliability of the actual drone (connection, range, sensors). In these regards, the P4P wins. I always go back to comparing how these models would work in the mountains (typically a bad connection area) and having a reliable connection is key to having a safe flight there. I’ve seen numerous times DJI models (with the exception of the Spark and Mavic Air) connect really quickly to numerous satellites in spite of the fact my phone connection wasn’t working in the same area and this provided me with a safe flight I could rely on. Most noteworthy is the fact that the Mavic Pro and P4P are the best at this. By the way, if you currently don’t own a P4P, do note that it’s upgraded to the P4P V2.0 (same price, same specs, but tiny extra benefits) which is the same thing, but with a more reliable connection (so it’s even better). While I know the Evo will also do well in these areas, from what I’ve seen with the connection issues that sometimes arise, the P4P will be far more reliable in difficult connection areas and that will lead to a lot more flights being done, safely. Do note that the P4P uses lightbridge for connection, while the P4P V2.0 uses ocusync which is even more reliable and the Evo uses advanced WiFi (least reliable). Know the difference. If your wallet is severely affected by a few $100, then get yourself the Evo, it’s about $500 LESS expensive than the P4P. If not, get the P4P. Overall, the abilities both models have in terms of filming is phenomenal, but the P4P slightly wins here. Also it’s overall capabilities in terms of flight, reliability also play a huge role in me recommending it in that regard. The portability (whilst also filming very well). And price. You’re looking at substantial savings with this one. So in finalizing this comparison, these are the 4 factors I’d look at and see where you personally identify closest with, from that I would decide on which of these 2 models you’d buy.